Red Rock Gear's Rambler Sling Pack features a single strap to allow the pack to be easily transferred from the back to the chest for quick access to the main compartment which contains several mesh pockets and dividers. When across the chest, the openings face up granting direct access to the Rambler’s contents. Two front external compartments serve as utility pockets, with the larger having a key holder clip. The Rambler makes a perfect CCW pack with quick-access to all of the compartments. A mesh padded back panel opens horizontally and can hold up to a 2.5 liter hydration bladder (hydration bladder sold separately). 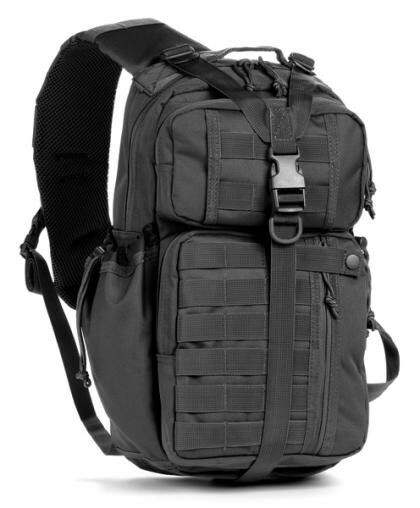 The Rambler Sling Pack boasts 15 liters of total compartment space.